1. I will begin the discussion of Kafka's story from its end: the brief confessional speech that the hunger artist delivers to the overseer, the single moment when he opens his mouth, which has been shut to food, and speaks. (He does occasionally sing, as a shield against the suspicion he feels is directed at him constantly, the suspicion that he eats when no one is looking). The speech is a unique linguistic moment for one who communicates with the audience through body and flesh, turning them towards the spectators as a way of avoiding language. He who neither eats nor speaks would occasionally sing (like the singing mouse Josefina). Therefore the dialogical communication, the addressing of the audience, the disclosure of the secret of the absence of taste – the reason for his fasting is that "nothing tastes good" – this unenlightening explanation is a unique linguistic event. We might have thought this was about the triumph of willpower or the victory of spirit over the flesh, but the story looks closely, with visual-lingual diligence, at the starved, dwindling body, the grim remains, and finds an instant replacement in the young, vital body of the panther introduced into the cage of the hunger artist after his death. The animal vitality of the new exhibit, a wild creature, eradicates in one fell swoop the dying agony of the desire to fast till death and beyond. How can one succeed in something that has no scale, which strives to break free of the yoke of counting and calculating, to touch infinity - or rather (im)mortality, unsurpassed, on the brink and at the end of life's duration. And while we are at it, we realize that this is a spectacle, a production, organized and managed, calculated and based on economic profit considerations. An asceticism seemingly suggesting the possibility of altruistic martyrdom is revealed to be in poor taste: the spectacle is a show, entertainment. This is privatized martyrdom; being the best, a champion of fasting. The self-deception of the fasticide, exposed as such in the story, the possibility of showing the fast as a theatrical act (obscuring the fact that he cannot behave otherwise, as he explains in that final confession), in turn exposes the audience – the clients, and the readers of the story as well – as consumers of attractions, aficionados of bizarre spectacles. The attraction is diluted, losing its flamboyant logic when it becomes clear that the hunger artist can only exist as one who does not eat, devoid of options to live otherwise (I exist as the one who fasts). The narrator reviews the thriving history of the hunger spectacles and reflects, somewhat gloomily, on the dwindling of this rich tradition that was failing to attract the crowd as before. The appearance of the hunger masters is a historical addendum to spectacles of phantasmagoria, to the presentations and simulations of horror tales and whooshing lifelike ghosts. This was the era of the flowering of the horror show genre in Paris and Western Europe, in theaters and circuses where humans were being displayed like exotic creatures: the Elephant Man, women from the African continent, and other attractions and colonial acquisitions common in the early 19th century, starting to disappear only towards its end. The hunger artist in the story is helplessly stuck in the tail-end of that era and the fading interest in this kind of show. He has no mode of being other than demonstrating by not eating, by a total mortification of his own body. He chooses to fast as a mode of physical and theatrical existence that is also subsistence, which creates value, economic or otherwise, for all involved – the organizers and the performer. The notion of profitability seems to be clownishly emptying of its meaning. The economic terms are jumbled, become comical in the context of the hunger artist, except perhaps the impresario who tries to preserve the entertainment value (such an entertainment value, despicably bloody and comic, also exists in the story In the Penal Colony. The spectators have come to stare at the "sublime happiness that radiated from the tortured faces, how we turned our cheeks to the glory of the barely-achieved justice, already fleeting! Ah, those were the times…" A spectacle of law-giving and engraving upon the body, just as transient). Our story, which is about fasting, feeds us chock full of possibilities, hints, and suggestions of a meaning and a thematic context. For example, the notion of the similarity between the hunger artist and the image of the body of the Messiah, which is a ruined, invalid body, "despised and rejected of men" (Isaiah 53:3). In the end, the artist confesses, according to Christian tradition. The time allotted for the fast equals forty days, same as the number of fast days before Easter (Lent). But the Christian ritual of symbolic eating, the Eucharist, which repeats every Sunday and absolves all sins of those who perform it, is unavailable to him who has "a bone stuck in his throat" blocking the ability to eat (like the scriptural figure of speech, "a thorn in the flesh"). The forty-day duration of each performance is reminiscent of Moses's forty days of seclusion on Mount Sinai, during which he wrote the Covenant, or the prophet Elijah who survived the same number of days in the desert. Christian interpretation views these events as a prefiguration of the forty-day struggle of Jesus with Satan, also in the desert. In the same vein, we can also talk about Mohammed, who was aged forty at the time of his epiphany, or the rabbi Akiva who had only started his study of the Torah at that age. In the story, the forty-day period is explained in very practical terms – as a result of calculating the spectators' patience, the effectiveness of the physical state, and the like. We might also consider what kind of record this is, a record of not-eating, not as a hunger strike or a protest but as a remunerated performance, with an organizer/impresario, the master of this non-event. It is a life-threatening event, but contrary to, say, a roller-coaster, it is passive, there is no display except for that of the starving body. It is the attempt – as desperate as it is hopeless – to actualize what cannot be actualized, the occurrence inside the body, which cannot be transmuted into the external, except for the visible dwindling of the body as evidence of an empty stomach. 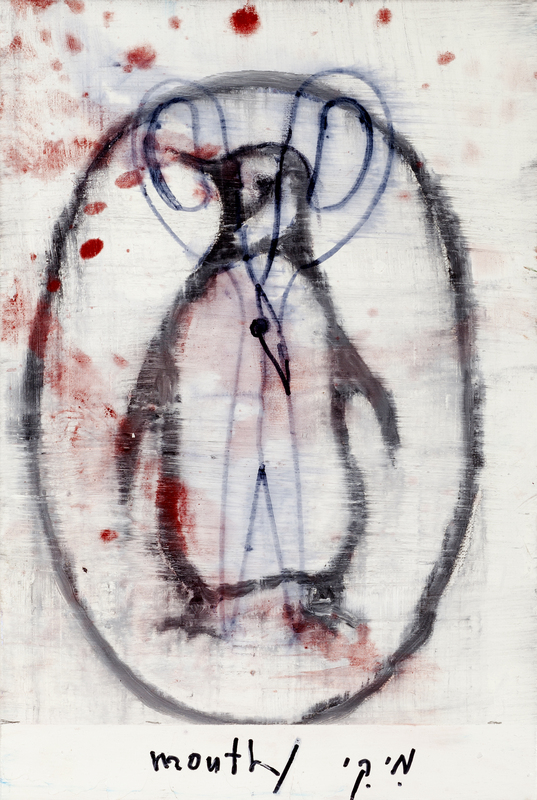 The artist is present here as the indicator of "nothing to see," to show just that – "there is nothing to present." The circus theme often occurs in Kafka's writings, and it includes theatrical events like the Nature Theater of Oklahoma in The Man Who Disappeared (Amerika), trapeze performances, and dancing. The circus here is home to a spectacle that reveals nothing. In the story, photographs are mentioned as documents and as evidence of the weariness of the fasting artist, but this new technology only causes the hunger artist further despair: the photographs that have realized his physical failure are unwelcome. The photographs’ context was the moment when he was obliged to break his fast – the physical collapse documented in the photographs is his reaction and his protest against being forced to break the fast and to have his picture taken as a souvenir of the event. His breakdown is related to the appearance of the instrument, and this is the context for the photographs: they lie about the visibility of his fast. The matter of the watchers and the overseers is another farce. They are all of the butcher's profession, for some reason - maybe being connaisseurs on the nature of meat and flesh, who enjoy a rich breakfast in return for watching him, but they do not perform their jobs very methodically, to the chagrin of the hunger artist. In the whirlpool of doubt he has submitted himself to, he is tortured by the concern that he is suspected of being a trickster, that he is violating the terms of the contract with the spectators – the bond of obedience to the rules of fasting because clearly the oversight has become denigrated and untrustworthy. This scandal echoes the account of the soldiers who were watching over the body of Christ while drawing lots for his clothes and possessions, and Christ's resurrection after three days is a miracle that cannot be backed by the testimony since the soldiers were sleeping when the rising from the tomb occurred. There are guards that Kafka tells about, who may not be bypassed by any means: the guard at the gateway to the law in the story Before the Law is one. And there are watchers whose very duty is to casually betray the act of guarding, like the lazy guards who fail to watch the mechanism of the tattoo-writing machine that deals punishment in the story In the Penal Colony. 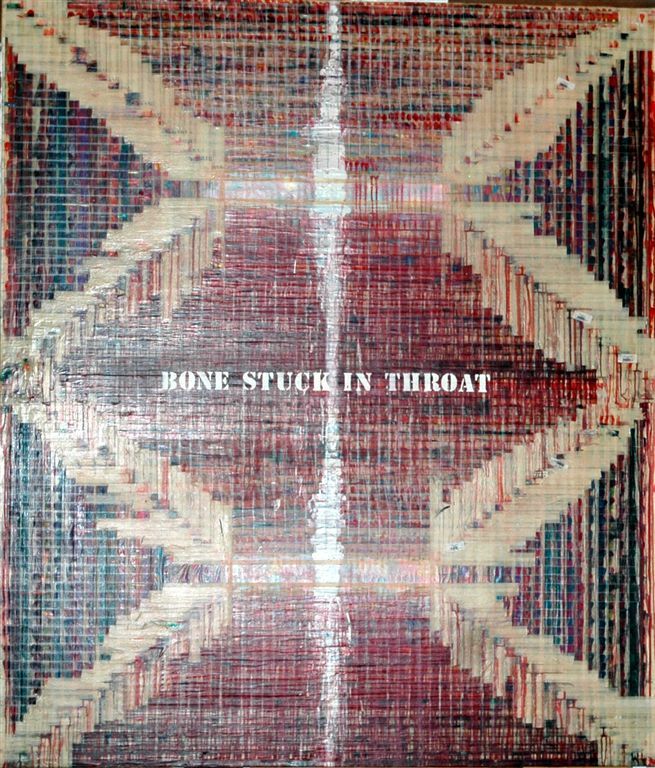 Toward the end of the story, quite offhandedly, the hunger artist's peculiar accomplishment of "fasting even more," totally, to the death, but without an audience, becomes evident. The absence of witnesses, of an audience, removed the vestiges of a point from the non-event of his fading into the straw bed lining the cage. The story, the text could be described as a glutton. It eats him, devours him, excretes him. The reader finds himself as the one in whose throat the hunger artist is lodged, sticking in his eye as he reads the whole extremely realistic description of the wounded, horrifying body, imploding under its own weight and fault, being carried by the two girls, the weight falling to one of them like a broken Pieta (and while we are at it, we might gobble up Bartleby as well). The desperate need of the hunger artist for active, severe, meticulous, and tireless testimony cannot be ignored. This need forces itself on the writing, on becoming "literature." 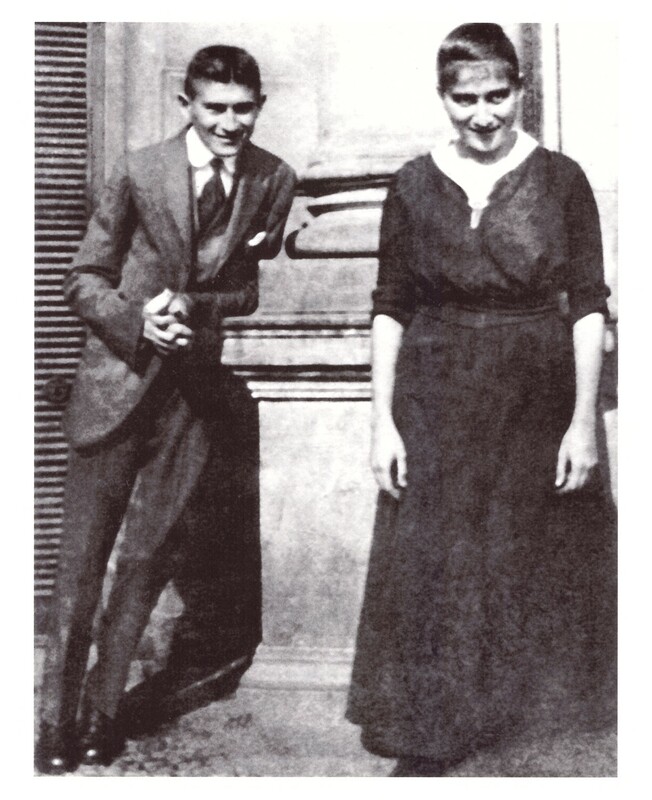 Kafka, who used to write with urgency, did not publish much and decreed that his writings be burned, disappear in fire, as if he recoiled from the ostentatious, audience - and reader - dependent element that lies at the foundation of the artistic endeavor, which is anxious to see the light but not of the burning kind. A branding incarnation of this flaming light can be found in the description of the glow of "sublime happiness" in the eyes and visage of the convict in the penal colony. And perhaps it makes sense to join this decimating radiance with the bright halo (and the false shining) of the tradition of art according to Benjamin. Kafka's writings were famously doomed to be destroyed, to remain unread and unobserved. Still, they survived, under the sign of annihilation. And then there is the fact that several years after Kafka's life has ended Europe, and in particular Eastern Europe, had been filled with bodies reduced to death, and the terrible figure of the muselmann (and according to Giorgio Agamben in What remains of Auschwitz – the Muselmann, the Muslim Man: "the most likely explanation of the term can be found in the literal meaning of the Arabic word muslim: the one who submits unconditionally to the will of God” )1. Perhaps that had been the fate of Kafka's sisters, who perished in Auschwitz in 1944, and of Milena Jesenská's in Ravensbrück that same year. 2. The abstention from eating was a particularly lush topic for the new science that had emerged at the end of the 19th century and the beginning of the 20th – psychoanalysis (and no less so the act of eating, an even more abundant source of psychoanalytic nourishment). 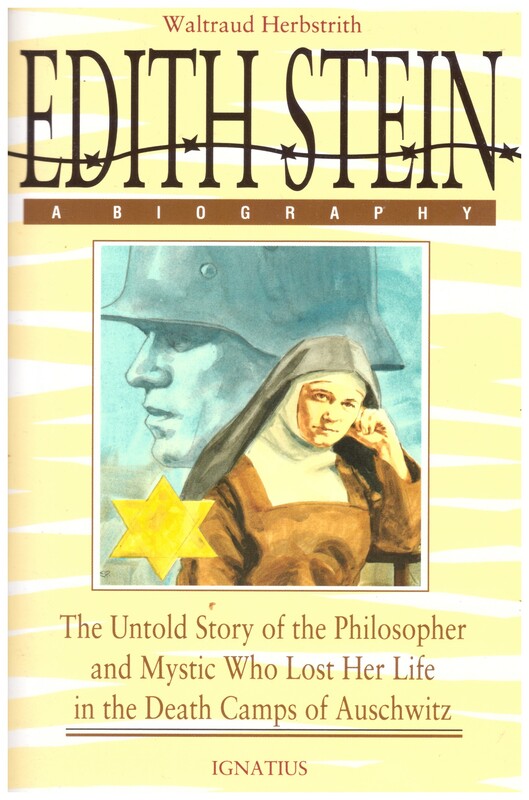 I refer to the anorexia that afflicted some of the patients treated in the early stage of the formation of this science, Jewish women of Vienna, for whom the symptom of inability to eat, to operate the mouth (as well as fasting, stuttering, gagging) was part of the so-called "theater of the hysterical body." I will mention several women who have participated in the critical moment of the shaping of this knowledge by male therapists, headed by Freud, a new field that resided in the overlap between philosophy and psychoanalysis. The first and the most famous (a movie was made about her!) 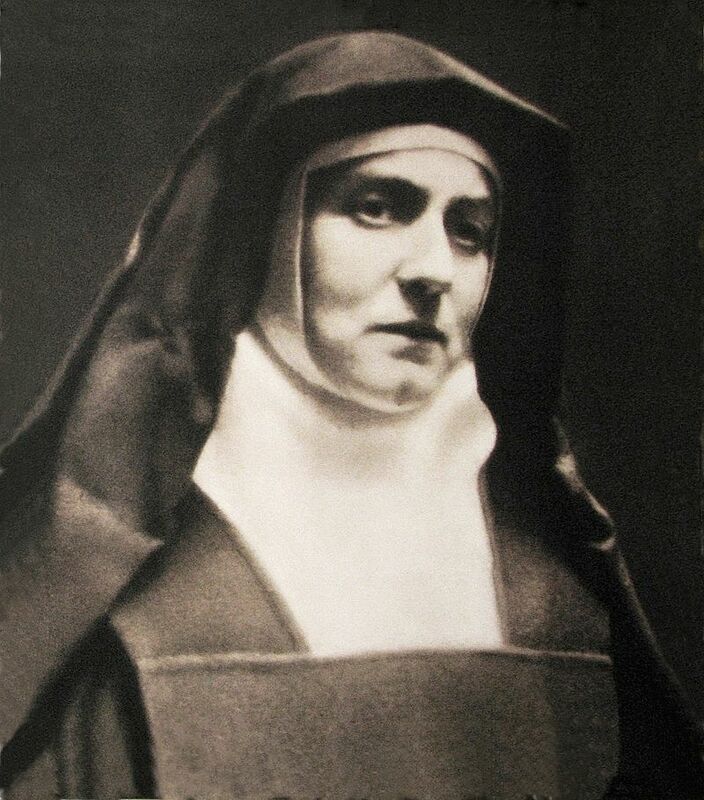 was Sabina Spielrein, a patient of Jung's, accepted as a sufferer of symptoms such as throat spasms and eating disorders, who went on to recover through the internalization of the analytic practice and became herself an analyst, and lived a long life. 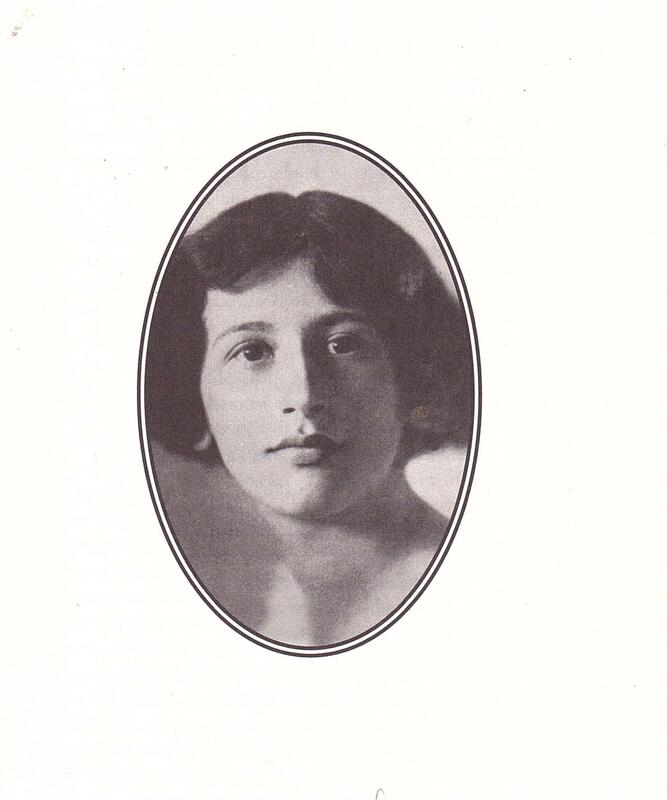 The last woman is Ellen West, a patient, also Jewish, of the philosopher and analyst Ludwig Binswanger, who preferred to die rather than eat… She kissed children with scarlet fever and ended up poisoning herself in 1921. For her eating equalled death, and death by poison was her escape from it. 3. An autobiographical note – what is my personal connection to the "bone in the craw" of all these people? My father's family has lived in the German city of Essen. If you scramble the letters, you get the English "sense." How strange that a person originating from a city whose name is the German verb "to eat" has a family with eating disorders. Neue Ruhr Zeitung, 21.9.1982. "Essen is Different." 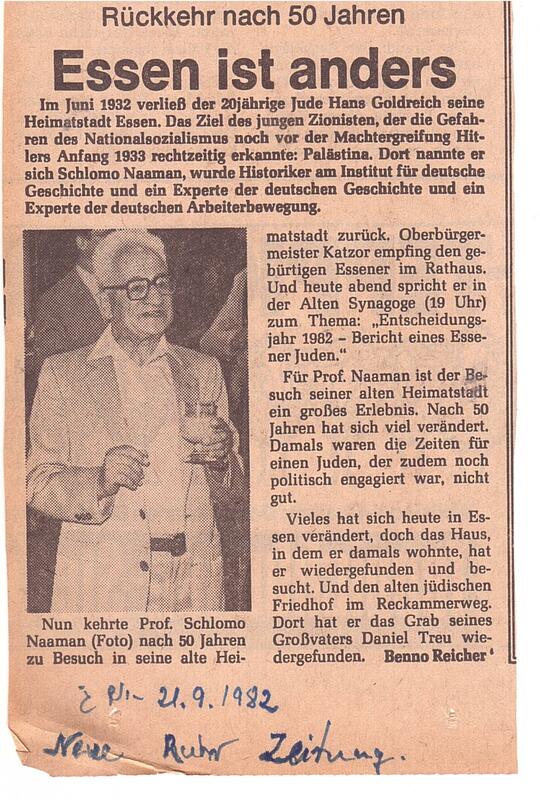 A newspaper clipping from the family archive describing the return of Michal Na'aman's father to Essen in 1982, during which he had received an honorary citizenship and delivered a lecture. 4. 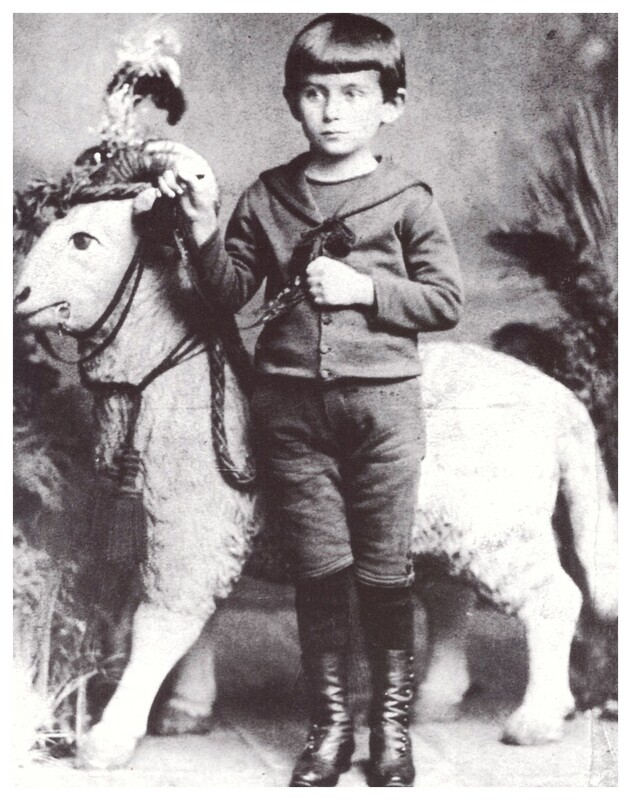 The themes of the original sin, guilt, and redemption are prevalent in Kafka's writings. 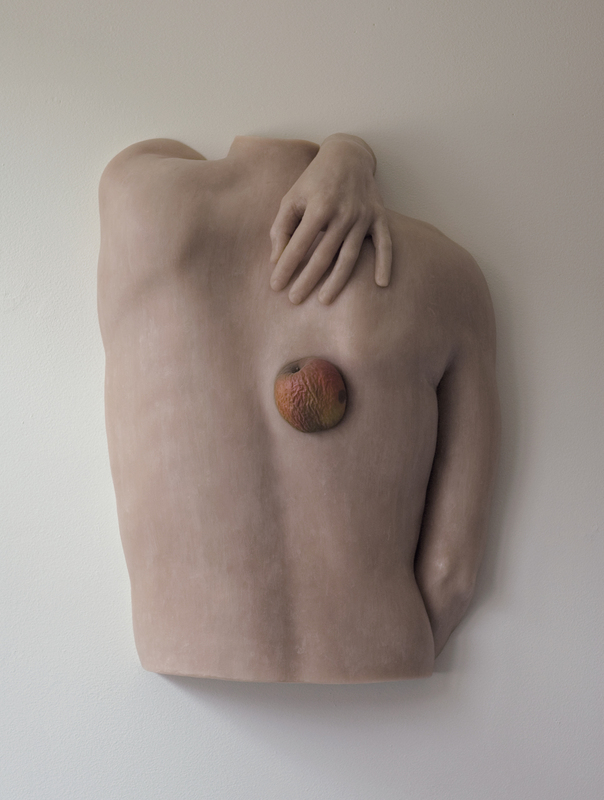 The apple lodged in Gregor-the-insect's back as a result of his father's murderous volley is one of the images related to this context. It might be said, then, that had the hunger artist been in Paradise at the critical moment of the invitation (by a relative of the insect ) to bite into the apple, he would have refused, easily, and humanity would have been saved - instant salvation. Anorexia in Paradise. * "… because I must fast, I have no choice…because I have not been able to find any food that tastes good to me, If I had, I would not be causing all this trouble, believe me, I would have eaten heartily, same as you and everybody else." ** Simone Weil: "We are a part that must imitate the whole." *** The title of my last show, "Mickie Mouth," a mouth instead of a mouse – is related to the discussion.